US Navy Veteran Mike Stone spends his days making the world a little more accessible for those in need. Long Island StairRider owner Mike Stone (left) and American Legion Babylon Post 94 Commander Tom Horn (right). Mike Stone of West Babylon, a US Navy veteran and owner/operator of Long Island StairRider, has been spending the past ten years of his life making the world more accessible to those who need it most. Long Island StairRider specializes in installation and repair of motorized stair lifts, which provide mobility for seniors, injured veterans, and anyone who has trouble with stairs. These motorized lifts can be installed in any staircase, and involve a swiveling, motorized chair that travels up a set track that enables the elderly, the handicapped, or anyone else suffering a physical ailment to navigate a stairway that may otherwise prove to be difficult or even impossible to climb. Mike Stone of West Babylon, a US Navy veteran and owner of Long Island StairRider. Stone attributes his success to the fact that he managed to get into a field where there was not only a great need, but also the fact that it's a business that genuinely helps people lead more productive, happier, and independent lives. “My company only installs and repairs stair lifts, and we do that on an active basis 24 hours a day, 7 days a week,” he said. “I've owned the business for about 10 years, and I got into it when a friend of mine who was working in a hospital emergency room told me that there was a big need for this type of thing. Motorized lifts can be installed in any staircase, and involves a swiveling, motorized chair that travels up a set track that assists anyone suffering a physical ailment get from floor to floor and back again. A defining aspect of Stone’s life is his military service; inspired by his grandfather who served in World War 1 and his father who was in the Merchant Marines and Coast Guard, he noted that being in the military was always a dream of his. Stone joined the Navy, in which he served from 1977 to 1980; while there, he was stationed in Asia and called many countries in that area home during the time of his service. After leaving the Navy, he said, he's remained involved both in the military and veterans affairs to this very day as part of the Coast Guard auxiliary and Disabled American Veterans. Mike Stone has been donating his time & expertise to make American Legion Post 94 in Babylon, NY more accessible for his fellow veterans. Stone is also an active member of the American Legion Post 94 in Babylon, where he’s been donating his expertise with motorized stair lifts to the betterment of his fellow vets. 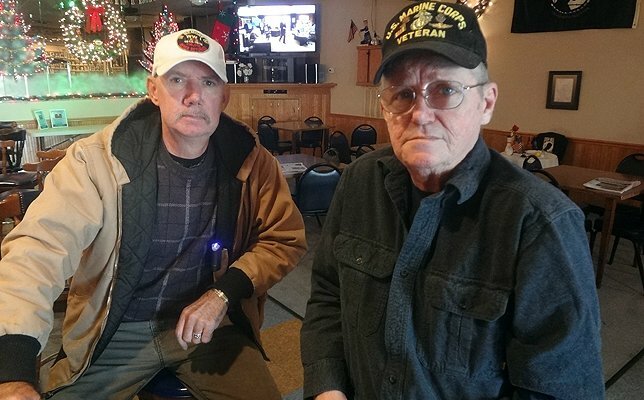 He noted that, due to his lifelong involvement in the military, giving back to his fellow vets is vital; therefore, whenever needed, Stone happily services and repairs the stair lifts at American Legion Post 94 at no charge. Long Island StairRider owner Mike Stone (L) and American Legion Babylon Post 94 Commander Tom Horn (R). Post 94’s Commander, Tom Horn, noted that events held at the Legion’s hall had long suffered upper floor accessibility issues on the part of their elderly and handicapped patrons; however, the problem was solved by the installation of motorized chair lifts in their stairway. Horn noted that Stone’s selfless efforts in keeping the chairs operational and running smoothly are greatly appreciated by he and his staff. “It's very helpful, because prior to having the chairs we would have events such as a christening upstairs, and the grandparents couldn't get up the stairs. So they spent the entire day of the christening downstairs, and people brought them down food,” he said. Long Island StairRider installs approximately 300 lifts a year, and when he's not busy installing these wondrous devices, Stone spends a lot of his time volunteering at the VA Medical Center in Northport as well as the Disabled American Veterans call center. To find out more about the mobility solutions the Long Island StairRider can provide for you or a loved one, please visit LongIslandStairRider.com, or call Mike at 631-278-1940. Subject: LongIsland.com - Your Name sent you Article details of "Babylon Veteran and Owner of Long Island StairRider Gives Back to His Fellow Vets"